During the Calvin Coolidge administration, I was a musician and composer. As I developed health issues, my performing days came to an end. Plus, as Neil said, “Rust Never Sleeps”. But I never stopped composing and (occasionally) producing. In my neophyte days, computing provided me the perfect way to continue down my musical path. And initially it did. But possessing the attention span of a maraca, I soon found myself more involved with the computer itself instead of using it as a means to an end. So much for composition. Eventually, my musical endeavors slowly vaporized. Having just recently reunited with some former bandmates, I was invited to collaborate on several projects. Though I could no longer perform, I could be involved through composition, arranging and producing. That made me feel so good! But as I can no longer pick-up my guitar or bass and begin noodling when inspiration strikes, I would have to return to my computer(s) and compose. I can’t convey to you what it’s like when you hear some music in your head. You have to play it ASAP, in order to remember it and then decide later whether or not to pursue the idea further. But chained to my desk (a work environment), trying to create an aesthetic work, can kill spontaneity in a heartbeat. My problem is the lack of portability. It would be great to break out of a business set up and work in another environment for a little while? Then I stumbled across this. The K-Board from Keith McMillan Instruments. “Just plug the USB cable into your computer … or tablet …, launch a music program and start playing. Finally, I can be anywhere and so long as I have my iPad, a camera dongle and my K-Board along, I can noodle when the muse strikes! Oh, that feels so sweet! 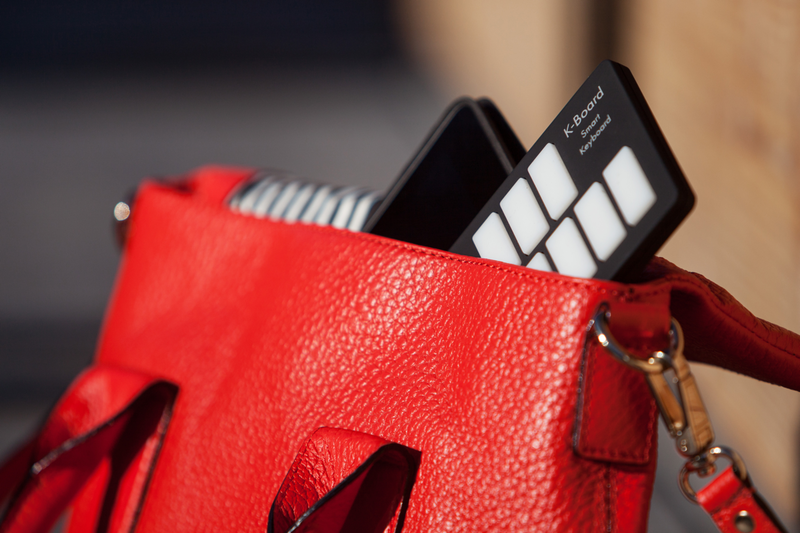 K-Board is a ‘keyboard controller.’ Basically meaning that however you choose to use it, the option is yours. 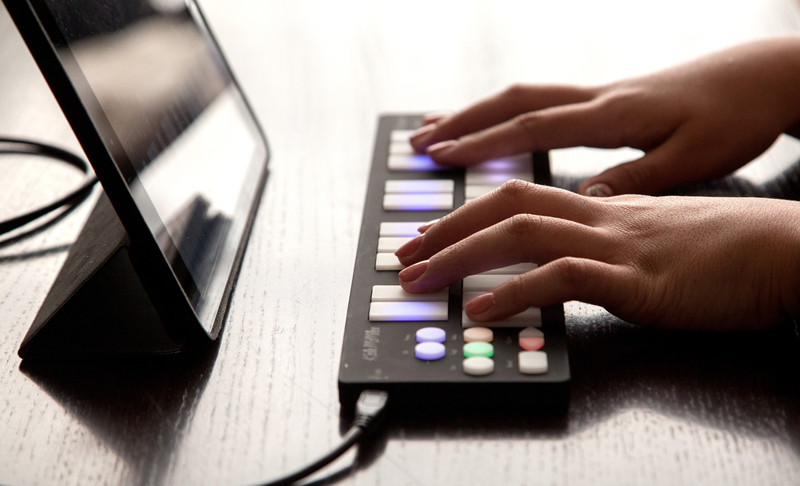 You can use it with your choice of musical keyboards, hardware or software. A whole page on the site is dedicated to video tutorials (use the QuNexus page videos); Plug and Play, General and CoMA (Controller Mapping Assistant). And if you are accustomed to screencasts, you will find these video tutorials invaluable and easy to follow. K-Board is bus-powered via a USB port micro jack. You have twenty five silicon key pads with velocity, pressure and tilt sensitivity. The 32 LEDs can be set to 16 different levels of brightness. 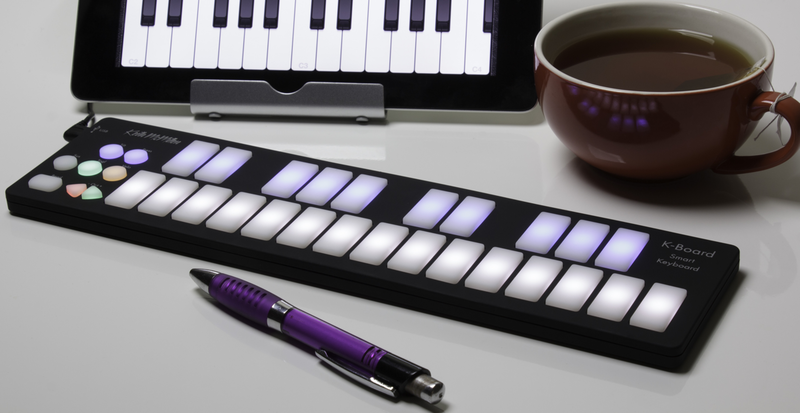 You most definitely would not use this as a keyboard for performing (unless you are particularly dexterous) but it is excellent for sketching out compositions and arrangements. Well worth the money. One drawback (in my case, at least) was that the controller really needed to be placed on a solid surface, such as a desktop. I was hoping to be able to place it in my lap and use it on the run with my iPad when the muse struck me but I experienced difficulty keeping it stable on my lap as the K-Board’s lightness tends to allow it to move about rather easily, making it a challenge to use it, say, outdoors at a park. But with a bit of practice (I’ll wait until winter is over, thank you) I could adapt and use it successfully. Besides providing me the ability to compose again, K-Board gave me the freedom to connect the K-Board to my MBA or iPad Mini retina (with a Lighting to USB Camera Adapter), place it into my bag, get out of the house and still indulge in creativity anywhere. That’s as inspirational as it is priceless! Or if you just want to dabble with Garageband, this piece of equipment will get you up and going in no time. Try it and you may surprise yourself. This entry was posted on Monday, March 2nd, 2015 at 12:48 am	and tagged with consumers, Frank Petrie, gadgets, hardware, music, Musical hardware, musical instrument, Review, reviews, YMP, YMPNow and posted in Reviews. You can follow any responses to this entry through the RSS 2.0 feed.